—as being equal with JS in holding the keys of the kingdom. Revelation, 8 Mar. 1833 [D&C 90:6, 19, 21]. Beginning in June 1830, JS used gatherings or “conferences” of church officers as deliberative bodies in which to conduct the business of the church, including disciplinary proceedings. In time, “general conferences” involving a substantial proportion of church officers were supplemented by more frequent ad hoc, or “special,” conferences. Beginning in 1832, the term “council” was used interchangeably with “conference” for these smaller, ad hoc meetings. JS and his counselors played leading roles in the proceedings. “the high council of the Church of Christ,” a standing body consisting entirely of high priests. Thereafter, the term “assistant president” was generally applied to those who had earlier been called counselors to JS, and members of the high council were called the presidency’s counselors, thus avoiding confusion in the use of the term counselor. See, for example, Minutes, 19 Feb. 1834; and JS, Journal, 13 Jan. 1836. ’s “assistants,” after which JS ordained “their twelve Counsellors”—the members of the high council. JS History, 1834–1836, 17–20; JS, Journal, 5 Dec. 1834. Minute Book 1, 26 Sept. 1835. JS, Journal, 21 Jan. 1836; Partridge, Journal, 21 Jan. 1836; Murdock, Journal, 3 Mar. 1836. Minute Book 1, 12 Feb. 1836; compare Resolution, 12 Feb. 1836.
. The close working relationships, and indeed the interrelationships of 1835–1836, therefore never materialized again. Hepzibah Richards, Kirtland, OH, to Willard Richards, Bedford, England, 18–19 Jan. 1838, Willard Richards, Papers, CHL. The term “first presidency,” first used officially in 1834, came into more general use during 1838 and eventually supplanted other nomenclature. See, for example, Revelation, ca. June 1835, in Evening and Morning Star, Oct. 1832 (June 1835), 73–74 [D&C 68:15, 19, 22]; compare Revelation, 1 Nov. 1831–A, in The Evening and the Morning Star, Oct. 1832,  [D&C 68:15, 22]; and Revelation, 1 Nov. 1831–A, in Doctrine and Covenants 22:2–3, 1835 ed. [D&C 68:15, 19, 22]. Minutes, 3 Sept. 1837; compare Minutes, 3 Sept. 1837, in JS, Journal, 4 Sept. 1837.
, Ohio, on 30 March 1836. This organizational effort included staffing each quorum, council, or presidency; organizing each quorum with a presidency; and clarifying relations among groups. JS History, 1834–1836, 17–20; JS, Journal, 27 and 29 Mar. 1836. See, for example, JS, Journal, 13 and 28 Jan. 1836; 27 Mar. 1836.
presidency returned to its local jurisdiction. Minute Book 2, 3 and 7 July 1834; JS, Journal, 29 Mar. 1836. Minutes, ca. 3–4 June 1831; Minute Book 2, 7 Apr. 1837; Quorum of the Twelve Apostles, Record, 2 May 1835; see also Partridge, Journal, 21 Jan. 1836.
high council apparently retained its original order, based on the 7 July 1834 casting of lots, with replacement members taking the number of their predecessors. Minutes, 3 July 1834; Minutes and Discourse, ca. 7 July 1834; Minute Book 2, 6 Jan. 1836; Minutes, 7 Nov. 1837 ; Partridge, Journal, 7 Jan. 1836.
was the president of the council in March 1836, he was still listed among the other members with his original number. Murdock, Journal, 3 Mar. 1836; compare Partridge, Journal, 21 Jan. 1836. Teachers Quorum, Minutes, 19 Mar. 1836. Teachers Quorum. Minutes, 1834–1845. CHL. MS 3428. Minutes, 3 July 1834; Minutes and Discourse, ca. 7 July 1834; Minute Book 2, 6 Jan. 1836; Minutes, 7 Nov. 1837 ; Murdock, Journal, 3 Mar. 1836.
stake and its high council. See, for example, Minute Book 1, 2 Jan. 1836; Minute Book 1, 16 May 1836; and JS, Journal, 13 Jan. 1836. Minute Book 1, 15 Jan. 1836. Minutes, 17 Aug. 1835; Partridge, Journal, 21 Jan. 1836. Cook and Backman, Kirtland Elders’ Quorum Record, 25 Jan. 1836; JS, Journal, 29 Jan. 1836. Minutes, 17 Feb. 1834; Minutes, 28–29 Aug. 1834; Minute Book 1, 13 Jan. 1836. Quorum of the Twelve Apostles, Record, 2 May 1835; Minute Book 1, 13 Jan. 1836; Partridge, Journal, 13 Jan. 1836. Listed in order of seniority—that is, age at time of appointment of the original Twelve. The presidents of the Seventy presided over the Quorum of the Seventy. The presidents were apparently ordered by seniority of age. Record of Seventies, bk. A, 3; The Twelve Apostles, [Kirtland, OH: ca. 7 Apr. 1836], copy at CHL; Quorum of the Twelve Apostles, Record, 2 May 1835; compare Minutes and Discourse, 2 May 1835–A. Minutes, Discourse, and Blessings, 14–15 Feb. 1835; The Twelve Apostles, [Kirtland, OH: ca. 7 Apr. 1836], copy at CHL. See Kirtland Camp, Journal; JS, Journal, 7 May 1838; and John Smith, Journal, 16 and 17 June 1838.
, Daviess County, Missouri, where a stake was organized on 28 June 1838. “Conference Minutes,” Elders’ Journal, Aug. 1838, 60–61. Minutes, 7 Nov. 1837 .
conference, and they were not again presented as such. Minutes, 7 Nov. 1837; Minute Book 2, 24 Feb. 1838; 6 July 1838; see also Letter from Edward Partridge, 5 Mar. 1839. Minute Book 2, 8 Apr. 1838.
presided over the quorum of priests. Instruction on Priesthood, between ca. 1 Mar. and ca. 4 May 1835 [D&C 107:87–88]. Teachers Quorum, Minutes, 15 Mar. 1838. Minutes, 7 Nov. 1837; Minute Book 2, 26 Jan. 1838; 7 and 12 Apr. 1838. Cook and Backman, Kirtland Elders’ Quorum Record, 10 June 1838. Hepzibah Richards, Kirtland, OH, to Willard Richards, Bedford, England, 18–19 Jan. 1838, Willard Richards, Papers, CHL; Cahoon, Autobiography, 42. Cook and Backman, Kirtland Elders’ Quorum Record, 10 and 17 June 1838; 8 July 1838. “Conference Minutes,” Elders’ Journal, Aug. 1838, 61. Quorum members held seniority according to age. Minutes and Discourse, 2 May 1835–A. The presidents of the Quorum of the Seventy were reorganized in April 1837 amid confusion over the relationship between high priests and seventies. Presidents of the Seventy who had been previously ordained high priests were reassigned to the high priests quorum, and new presidents of the Seventy were appointed to replace the outgoing high priests. Record of Seventies, bk. A, 6 Apr. 1837, 17–19; “Anniversary of the Church of Latter Day Saints,” LDS Messenger and Advocate, Apr. 1837, 2:486–487. 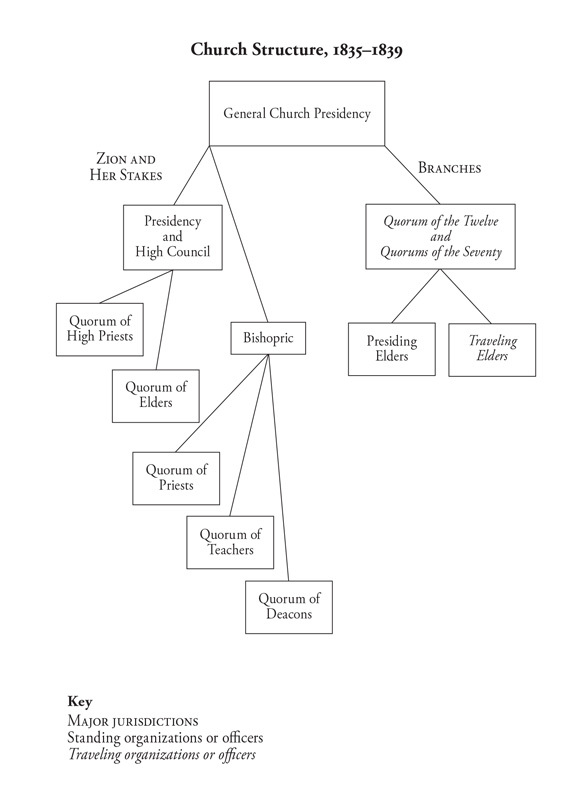 At its initial organization, the presidents of the Quorum of Seventy held seniority according to age; when the presidency was reorganized, new presidents assumed the level of seniority of the outgoing high priests. The presidents presided over three quorums of Seventy. Record of Seventies, bk. A, 20 Dec. 1836, 9–11. Record of Seventies, bk. A, 23; 13 Mar. 1838, 48. Record of Seventies, bk. A, 6 Mar. 1838, 44–45. “Conference Minutes,” Elders’ Journal, Aug. 1838, 61; see also Orson Hyde and Heber C. Kimball, Kirtland, OH, to JS, Far West, MO, ca. May 1838, in JS, Journal, 6 July 1838.
to replace the former quorum members, but none were ordained to office before December 1838. Revelation, 8 July 1838–A [D&C 118]. , now the central church unit, a “stake” like other major church units. Hepzibah Richards, Kirtland, OH, to Willard Richards, Bedford, England, 18–19 Jan. 1838, Willard Richards, Papers, CHL; “A Proclamation, to the Saints Scattered Abroad,” Times and Seasons, 15 Jan. 1841, 2:273–277. See Nauvoo High Council Minutes, 2 May 1840; 8 Aug. 1840; 20 June 1840. Nauvoo High Council Minutes, 8 Aug. 1840. Iowa Stake, Record, 19 Oct. 1839. Listed in the order established by drawing lots at the council’s initial organization. Minutes, Times and Seasons, Dec. 1839, 1:30; Iowa Stake, Record, 5 and 19 Oct. 1839; 7 Nov. 1839; 6 Dec. 1839.
to appoint the oldest of the original members to be president of the quorum. was sustained as president on 14 April 1840. Letter to Heber C. Kimball and Brigham Young, 16 Jan. 1839; Brigham Young, Preston, England, to “the Saints,” 17 Apr. 1840, Times and Seasons, June 1840, 1:119. The presidents of the Seventy presided over three quorums of Seventy and a number of seventy not assigned to a specific quorum. It is unclear whether there was an established order of seniority among the presidents. Record of Seventies, bk. A, 20 Dec. 1836, 9–11; 5–6 May 1839, 69. Record of Seventies, bk. A, 5 Jan. 1839, 57; Revelation, 19 Jan. 1841 [D&C 124:138]. were ordained 19 December 1838. Revelation, 8 July 1838–A [D&C 118]; Minute Book 2, 19 Dec. 1838.
, was not ordained until 14 April 1840. General Church Minutes, 26 Apr. 1839; 14 Apr. 1840; Brigham Young, Preston, England, to “the Saints,” 17 Apr. 1840, Times and Seasons, June 1840, 1:119.
be “suspended” until the next church conference, at which time they would be allowed to give an account of their conduct. Both were “restored” to their offices at a conference held in October 1839. General Church Minutes, 4 May 1839; Minutes, Times and Seasons, Dec. 1839, 1:30.